Though not an aircraft that is likely to be setting down at any Polish airport anytime soon, the Airbus A380 is a regular visitor to Polish skies. 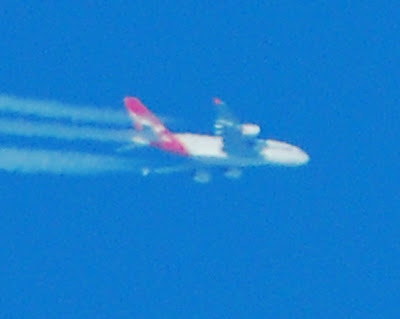 All three airlines that fly this type - Singapore, Emirates and Qantas, all overfly Poland. To catch them, all you need is a long, long, lens, a cloudless day - and to be at the right place at the right time. 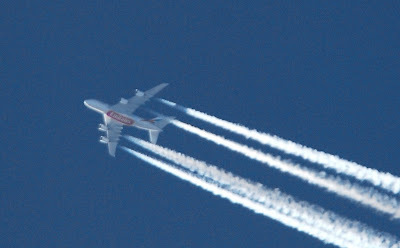 Below: Emirates Airbus A380 at 38,000ft over Mazowsze, photographed from Jeziorki on 11 January, headed for Dubai from New York (click to enlarge). If these pics appeal, there's an excellent Polish website, http://extremespotting.com, run by some guys down in Jasło and Bochnia, in south-eastern Poland. Using high-powered optics, they take photos of planes at great altitudes - even satellites in orbit! This pic - taken from Bochnia a day earlier, of the same plane making the inaugural flight to Sydney - show what these guys are capable of. Bochnia is some 30km north of Dobra, plus the lens used was three times longer than this one. Poland: Is there a crisis going on? A pavement for ul. Karczunkowska?